Look at that fabulous frosty view posted on Keld Public Hall’s facebook page this morning. If you are up that way the Keld Public Hall is offering a winter self-service tea and coffee facility (and locally made cakes too). We were so impressed when we visited last week and all to raise money to improve the facilities. The Every Barn project will be making full use of the hall later in the year for a project celebration – watch this space! We’ve already learned lots about the sorts of things people are interested in when they visit Muker – the barns and walls are of course top of the list. But what’s the thing that puzzles people the most? Well, apparently, everyone wants to know what those lines of sticking-out stones are for that you see on all the barns (and some field walls). They are known as ‘throughs’ or ‘truffs’ in the Swardle dialect. They are long stones that, as their name suggests, run right through the wall thus providing strength. However, we’ve heard one or two other stories…. As part of the Every Barn… project we hope to produce some bespoke interpretation for local visitor businesses. We’ve begun the process by dropping by some of these businesses to see what their customers want and how we might be able to help. We have already been really impressed by the visitor ‘offer’ available in Muker Parish and how enthusiastic business owners are about our project. Featured is the Farmers Arms in Muker who had the rather brilliant idea of table games disguised as beer mats. We’re sure we can come up with something along these lines that tell people some cow’uss stories in a fun way. 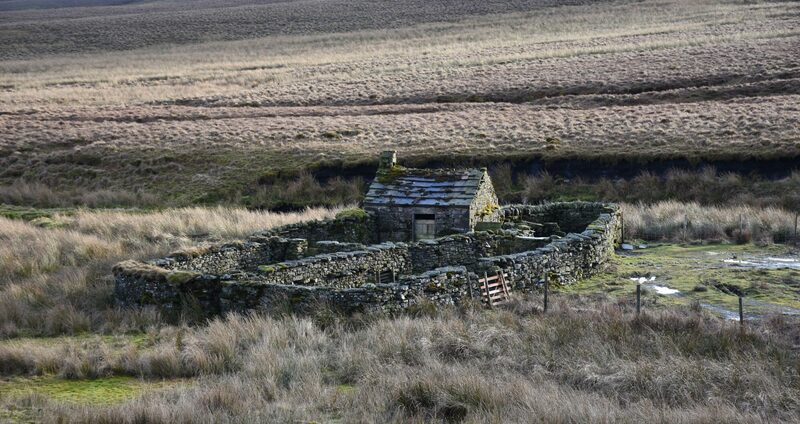 A rapid trip through Muker yesterday gave the opportunity to take some photo’s of the barns and walls landscape..
Photo’s by Miles Johnson and Rebecca Cadbury-Simmons (YDNPA) – using cameras generously provided to the project via the HLF. As well as recording the memories of local people who owned and used the cow’usses around Muker, we have also been asking for copies of family photographs to help illustrate their stories. This lovely example belongs to Chris & Raymond Calvert of Keld and shows Kit & Mary Calvert of Hoggarths, Keld having their hay time tea with their family in the shelter of Purse Cow’uss.